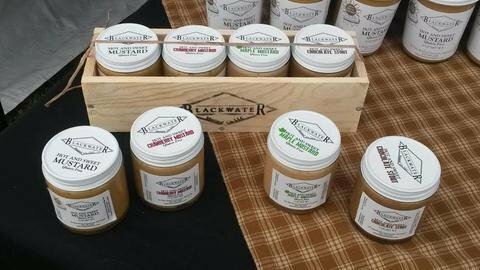 Blackwater Mustard Co makes a variety of mustards in small batches by hand. Located in a rural New England setting close to the banks of the Blackwater River, our products are made with quality ingredients with NO emulsifiers or preservatives. Chocolate Stout Mustard: This is a Hot/Sweet Mustard made with a reduced chocolate stout ale. You get the sweet, then the HEAT and faint hint of chocolate at the finish. Astonishingly delicious for dipping or as a secret weapon in the kitchen. Everyday Cafe & Pub: A double whole seed spicy mustard developed in conjunction with Chef Devon Clark of the Everyday Cafe and Pub. A truly versatile deli staple that has been integrated into numerous aspects of their comprehensive menu. Beechwood Mustard: Our Beechwood is a medium heat smooth mustard created for the Biergarten Bistro at the Anhuser Busch Brewery in Merrimack N.H. Best when paired with their signature Hot Soft pretzels or your favorite bratwurst! Cranberry Mustard: Cranberry Mustard is a versatile and mild addition to glazes, sandwiches, and vinaigrette's. The first thing Jill did with it after we perfected the mustard recipe, was to add it to coleslaw! Great for turkey, chicken or just dipping. Garlic Mustard: Cracked and whole seed blends highlight our low sugar garlic infused mustard. Maple Mustard: If nothing says "New England" like the natural taste of maple, our Maple Mustard is talking directly to you! A bit more tame than the Original and Chocolate, this medium heat mustard tends to be on the sweet side with a bold Maple flavor. Number 5 Tavern Mustard: Created by us as the house mustard for the Number 5 Tavern in Hopkinton, N.H., this stone ground medium heat mustard has curiously welcoming rich and thick flavor. The patrons at the #5 are greeted with a bowl of pretzels and a cup of mustard upon arrival. Now you can enjoy the same great taste at home. Hot & Sweet Mustard: This is how it all began... Our Original Mustard took a Gold Medal in a World Wide competition at the National Mustard Museum in 2011, and continues to win the praises and hearts of mustard lovers everywhere. NH Ale: - This is a smooth medium heat mustard made with the 603 brewery's Famous N.H American Ale. Apple Cider Mustard: The Future of Mustard is HERE! This is a tart, smooth Apple Concoction made from Gould HILL Farm reduced apple cider and our unique blend of mustard and spices is a real treat.